Bugolobi is a typical, diverse residential area in Kampala which grows increasingly upscale as you climb from the more sketchy valleys to the top of the hill. 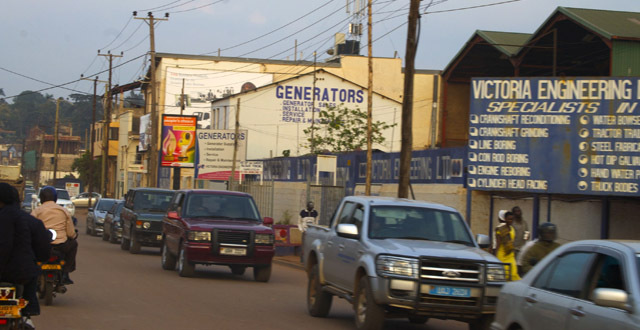 Bugolobi’s distinguishing factor, however, is that it encompasses the industrial area. Here, the smell of good African coffee and bread, being baked in mass quantities, makes for a salivating boda ride. The Industrial area has a great urban feel, full of big factories and company headquarters. Naturally, there isn’t a lot of pedestrian traffic in the industrial area but you can find some obscure and practical goodies around. Peacock paints has a storefront in the industrial area where they mix any color that you need (you can do the same thing at more conveniently located Game grocery store in Lugogogo but it’s more expensive). I once had a friend on a mad search for helium in Kampala and we found a factory in the industrial area that was glad to provide us with the small quantity she needed. Along with a few other great restaurants, my current favorite place to hang out in Kampala, Fas Fas art gallery/cafe/bar is located just on the fringe of the industrial area. Bugolobi is somewhat of a hub for local artists, and Fas Fas is perhaps the peak of this scene, maintaining the cool urban, grimy feel of the area. Royal Suites – A private resort development with fully furnished apartments. Nice ambiance but famously noisy due to parties in the evenings, if that’s your thing, this is the place for you. Private pool. Available for short or long term stays, apartments range from $1,700-3,200 per month. Bugolobi Luxury Apartments – Fully furnished, 24/7 room service and cleaning services! Olympic pool and fitness center. Sauna, steam room and massage available. Apartments run for about $2200, call for details. Thomas Moore Apartments – Fully furnished apartments with a bar and restaurant on the grounds. $65-$95 per night or $2500 per month. Smaller, boutique hotels cover Bugolobi. They’re a bit out of the way but if you’re doing business in Kampala it’s not a bad location. Olive Garden Hotel and Le Bougainvillier are two of the more aesthetically pleasing boutique hotels. “Red Chillis”/ Red Chilli Hideaway is the best backpackers option in the area. Le Bougainvillier – Mediterranean themed hotel, with a slightly rustic charm. A pool, sauna, wifi, relaxing atmosphere, Delicious Mediterranean cuisine and French wines! A more personal touch than the big chain hotels, still really great accommodations at a good value. Breakfast included. Book standard rooms, apartments and everything in between from $100-$130 per night. Dolphin Suites – A nice pool, health club, gym, sauna and steam room. A restaurant and a fully stocked bar. Accommodations include fully furnished one and two bedroom apartments. A nice, quiet location and a clean hotel, but nothing special, perhaps not the best value for your money at $99-$119 per night. $1800-$3000 per month. Red Chilli Hideaway – Near Bugolobi, good budget accommodations for travelers. Camping, dorm beds, private rooms and cottages suitable for groups or families. Fully stocked bar and a pool table. A restaurant that serves breakfast, lunch and dinner, highly recommended pizzas. Free wifi available from 8am-11pm. A tiny pool. Barbecue and picnic areas available for guests to cook out. Red Chilli’s offers guided trips Murchison Falls and Queen Elizabeth National Parks and the staff is ready and willing to help you plan any trip or safari. Accommodations range from $5-$65 per night. City Royal Resort Hotel – Decent rooms and pool, good Indian and Italian food, nice staff. Breakfast included. Prices start at $114 per night. Olive Garden Hotel – Budget accommodations. Thatch hut bungalows, nice gardens, quaint restaurant with local and international cuisine, full bar. Rooms range from $65-$150. There’s not much recreational shopping in Bugolobi, but three trusty super marekts can provide for all of your daily needs. Nakumatt, open 24 hours, is especially convenient. There are some odds and ends you can pick up in the industrial area, so far we’ve discovered helium and paint for walls and exteriors. You can also buy unique, one of a kind art pieces at Fas Fast. Jazz Supermarket – Well stocked extensive supermarket. Quality Shoppers – Well stocked extensive supermarket. Nakumatt – 24 hours, well stocked extensive supermarket, lots of imported foods. Bugolobi is a bit of a hub for local artists, fun day time activities include touring the very small art galleries at Fas Fas and Tulifanya. I also like to wander around the industrial area and take photos of the cool buildings, but that’s weird. National Forestry Authority Gardens – Agro-tourism center, conservation experts. Extensive trail networks over several locations, guided and unguided tours and birdwatching are available. Gorgeous grounds which often host special events and receptions. Bugolobi’s restaurants have superior energy. Usually secluded from the main roads and set up with intentional, unique ambiance. La Bougenviller and The Pizzeria are great date night options where you can dine on delicious food udner romantic lighting. Fas Fas is always fun with a group of friends, and Tandoori Pavement is a great place to grab a bite while on the run. La Bougenviller – Great Mediterranean food and french wines attached to a boutique hotel. Lovely, quiet grounds and good service. The Pizzeria – Really, really good pizza, good pasta, delicious ice cream. A cool atmosphere, palm trees, candles, lanterns, and flowers. Beautiful palms and flowers, spacious, great place to bring a large party because they have lots of big tables. Tandoori Pavement Indian Chinese (Pavement: Sizzles and Flames) – The name is up for debate. A surprisingly decent ambiance amidst a strip of grocery stores and ATMs in Bugolobi. Large portions of good Indian and Chinese food, rare air-conditioning and decent service. Open in the morning, closes for the afternoon and reopens at 5.30. Prices range from about $3-$7. Fas Fas – Equally qualifies as a restaurant, cafe and nightlife destination. Great food, cheap sandwiches, full bar. Often hosts live music or art events. Gallery with constantly changing exhibits. Kind of grungy, very cozy. If you’re looking for something to do any night in Bugolobi, Gatto Matto is a great option. Although there isn’t much other “nightlife” the restaurants listed below are really great evening destinations and Fas Fas has a great loungey atmosphere at night, especially on the weekends. Gatto Matto – Used to be called Catch the Sun. Cool bar with bon fires, usually free entrance and live music! Jazz band every Tuesday (same as Emin Pasha), and free entrance for live music every Friday at 8pm. Karaoke nights. Amigo – A local hole in the wall bar and restaurant. Open 24/7. Cheap beer. Pool table, games on TV, local food. Jazz Ville – A cozy jazz bar with low-lights, candles and wooden tables. Live jazz almost every night of the week, keep your eyes open for cool acts! Virgin Island – Night club, sometimes hosts prominent local musicians. Jazzville – Great ambiance, live jazz.